Viola Tita Martinez, 95, passed away Aug. 31, 2018 in Pueblo, Colo. She was born Sept. 18, 1922 in Ocate, N.M. to Jose and Escolastica (Sandoval) Romero who preceded her in death along with husband, Cornelio Martinez and all her siblings. 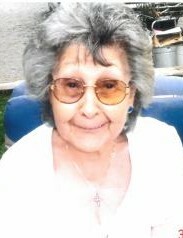 She enjoyed embroidering and watching game shows. She loved going to church and spending time with her family. Viola leaves to cherish her memory; her children, Leo (Vicky) Sandoval, JoAnne Rivera, Juanita Martinez, and Floyd Martinez; eight grandchildren; 22 great-grandchildren; 11 great-great-grandchildren; a host of other relatives and friends. Visitation, 9 a.m., funeral service, 10 a.m. Saturday, Sept. 8, 2018, both at West Street Baptist Church. Interment, Roselawn Cemetery.